No injuries or damage reported as rocket fired by Gaza terrorists lands in open area. Terrorists fired a rocket from the Gaza Strip that exploded in an open area near the Sha'ar Hanegev Regional Council. There were no casualties and no damage was reported. The red alert siren did not sound because the rocket was fired at an open area. The southern border has recently been quiet compared with Israel's northern border. This morning, the IDF Spokesperson clarified that there had been no leakage of mortar shells from Syria into the northern Golan Heights, as reported by the media. Surveys in the area indicate that a single machine gun was fired at the UNDOF camp near the fence in the northern Golan Heights, and a fire broke out in a nearby minefield. 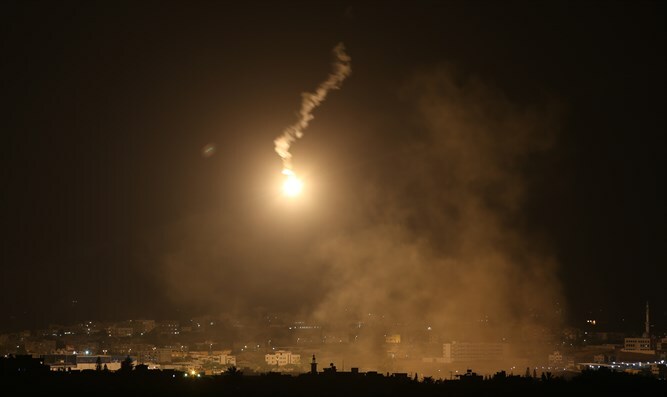 However, on Saturday and Sunday, mortar shells were fired from Syria into Israeli territory, and that in both cases IDF forces reacted quickly to the mortar strikes. Prime Minister Binyaamin Netanyahu referred to the issue at the start of the weekly cabinet meeting yesterday, and made it clear that Israel would respond to every attack. "Last night the IDF attacked Syrian military targets. This was a vigorous response to mortar fire at our territory. Our policy is clear: We will not tolerate any spillover or trickle whatsoever – neither mortars nor rockets, from any front. We will respond strongly to any attack on our territory or our citizens," Netanyahu said. "We also view with utmost gravity Iran's attempts to establish itself militarily in Syria as well as its attempts to arm Hezbollah – via Syria and Lebanon – with advanced weaponry."